Blog - Page 5 of 5 - 1928 Planning Co. Deciding whether to give favors to guests and then choosing what the favor should be is often one of those small-scale back-burner decisions that may not be thought about much until all of the big wedding planning decisions are out of the way. Although this is often the case, it’s important to remember that creative favors are one of the easiest ways to put a little personal twist on the gift your guests will take home. Regardless of what you choose to give, it should always be something that represents you, and your relationship or personality. The gift of giving we’ve seen has remained constant, coming in two forms, either a physical item to give guests or in place of a favor, the couple giving a donation to an organization or association that has a special impact on them. This post is all about sharing some of the top creative favors for guests! Check it out! Simply put, if you create the favor yourself, it’ll be personal, guaranteed! Let the creative gears spin on this one! 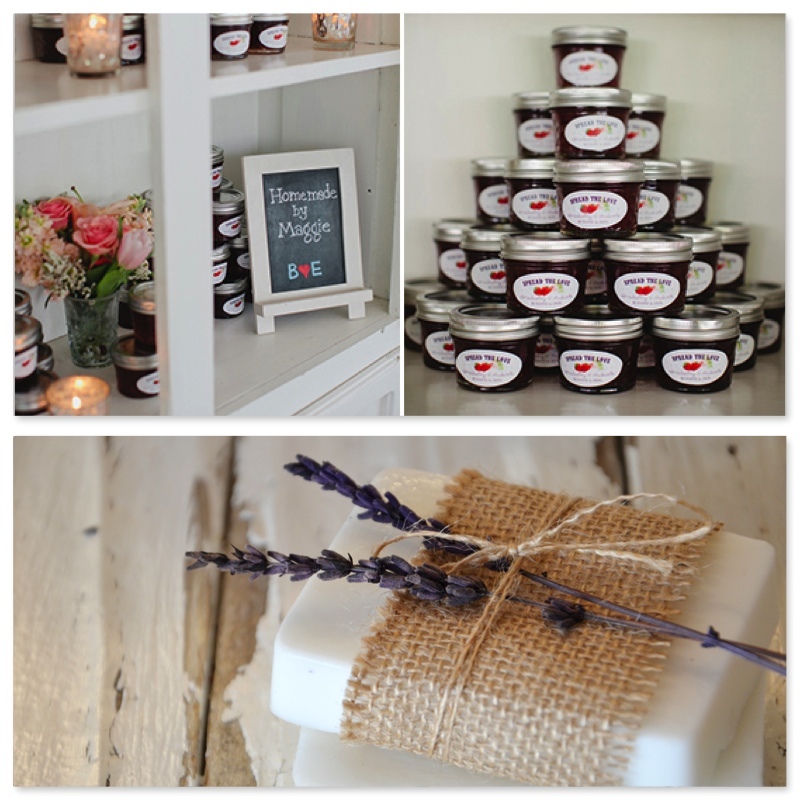 We’ve seen a bunch of unique, DIY creative favors – anywhere from coasters, bookmarks, caramels and some of my personal favorites homemade jam and soap. Have your guest favors be a shout out to where you’re from! 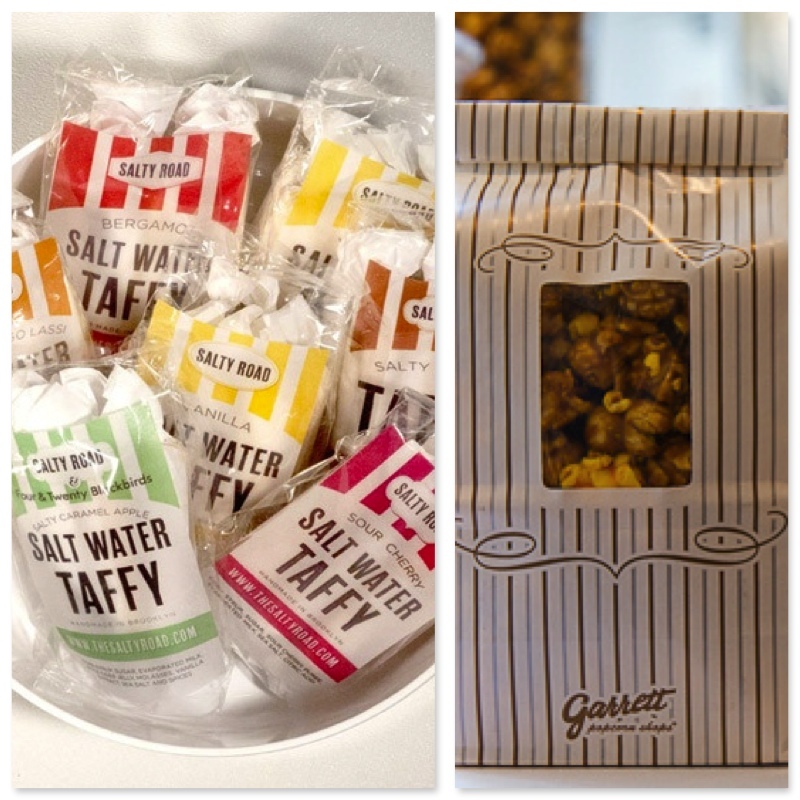 These unique favors could be anywhere from Mackinac Island fudge, salt water taffy, or one of my favorites (and guilty pleasure) individual Garrett’s Popcorn snacks. Regardless of where you’re from, there will be plenty of ways to give recognition to your roots while having something creative to surprise guests with. Since so many of our couples travel to St Joe to tie the knot and have a mini-destination wedding, giving guests a regional treat as a favor is an easy way to keep your theme going. Michigan mitten shaped chocolates, caramel apples from the Chocolate Cafe, we’ve seen it all! Give guests something to talk about! There are tons of resources to finding the perfect creative favor! Try out either Michigan Gourmet Travels or Purely Michigan for more great Michigan inspired ideas! Important takeaway:: make sure the creative favor you’ve selected to give guests reflects who the two of you are! Hope this post gets your ideas flowing! Looking for more brainstorming ideas? Contact us! 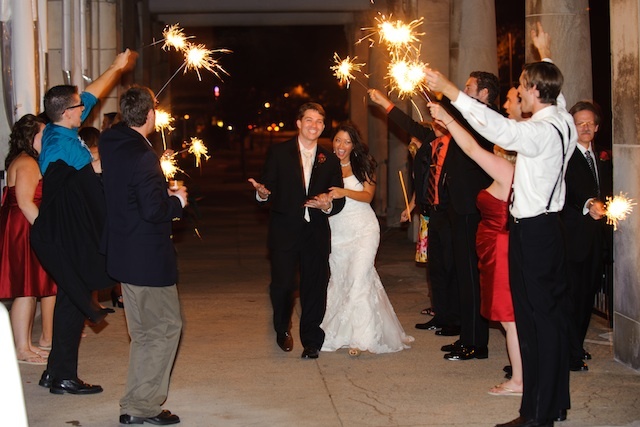 Whether it be an evening grand exit or the ceremony recessional, it’s been tradition for newlyweds to celebrate their exits by going out with a bang! 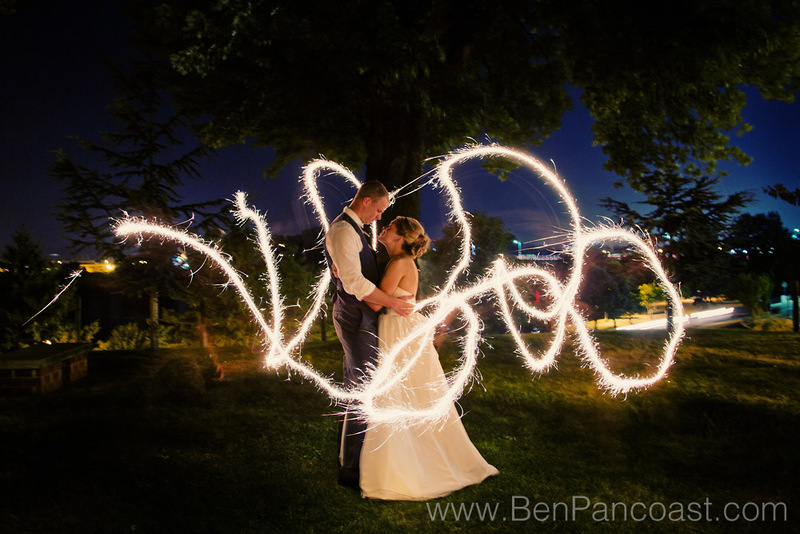 Here’s a combination of what we’ve seen our couples do for a creative and awe-inspiring wedding send off and what’s up and coming for both ceremony and reception exits! 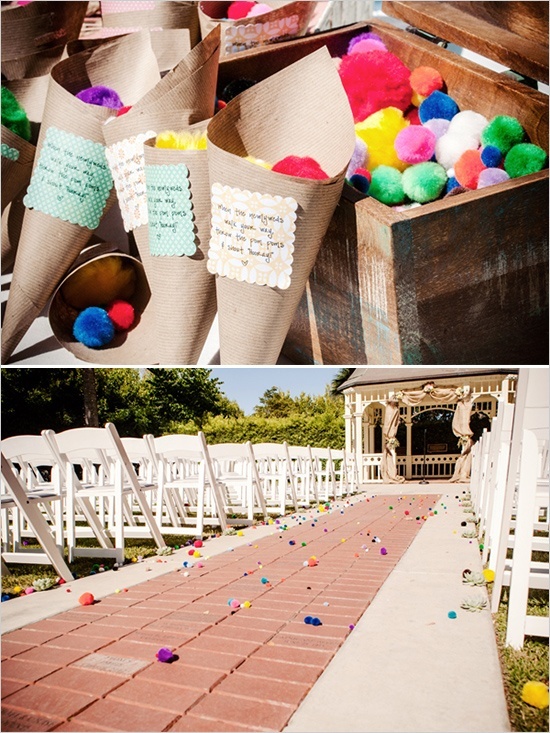 Used traditionally for ceremony recessional exits were to toss rose petals, rice, confetti or blow bubbles. Just like other wedding elements, the traditional wedding send off items have been reinvented into so much more! 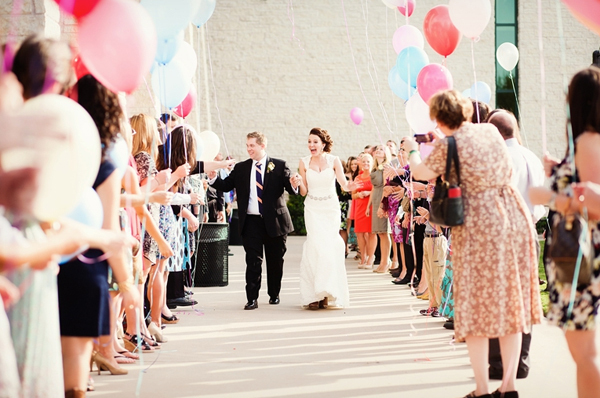 Here are some of the items for a ceremony recessional we LOVE! Balloons to line the walkway and be released on the count of three! 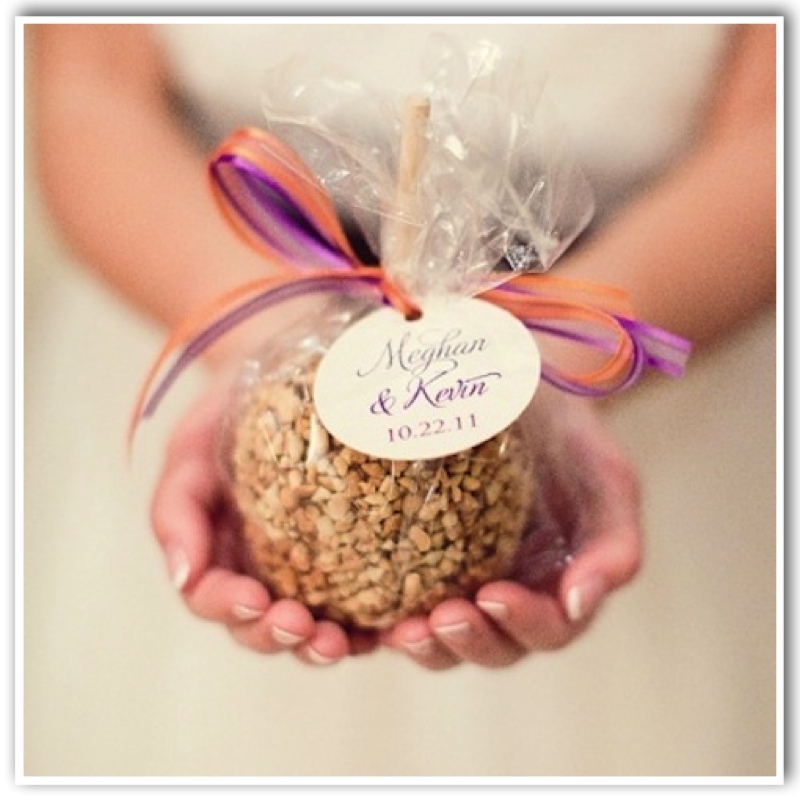 Other wedding send off ideas we love are tossed feathers or lavender as well as colorful ribbon dowels. What could be more of a perfect wedding send off than this? Just like I say in all of my posts, try something unique! Chances are your guests have been to several weddings previous to yours. Give them something to talk about right from the get-go that they’ll have fun with and remember long after the wedding is over. I always love when couples choose big impact decorations at their reception and when the wedding send off isn’t overlooked! Not only are evening exits the perfect note to end the reception on but are always great photo ops you’ll want your photographer to capture! We’ve seen a ton of AWESOME send offs – here are some of our favorites! Tips for your wedding send off: consider the clean up involved afterwards as well as the user-friendliness of the send off item you’ve decided to use! Make sure you inform guests when and where to use them! Hope to see some of these great send off’s! Contact us for more great ideas! Deciding whether to have an adult-only reception or a reception that welcomes all ages doesn’t have to be the tough decision its been tagged to be! Some view kids at the reception a daunting idea (insert screams, fits, and horseplay happening all night long). 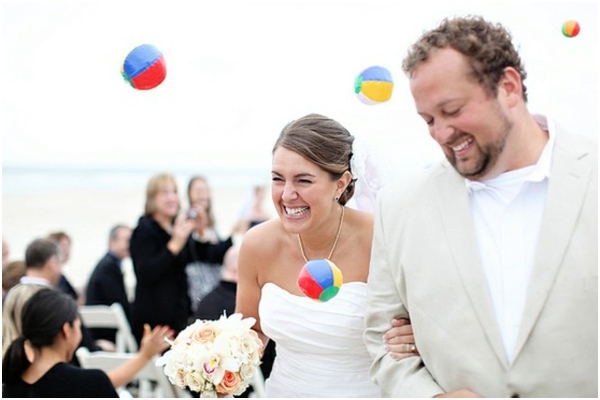 Take it from us who’ve coordinated tons of weddings – it doesn’t have to be like that! If you’re wanting to invite the kiddos to your reception, your attention should then turn to what to do with them – how to occupy them and make sure they are having a good time! Here are four tips to keeping the kids (and their parents for that matter) enjoying themselves during your wedding reception! Kids will be more content if they are able to eat food they are used to, rather than the fancier meals typically served at weddings. This is one of the many reasons we love working with caterer, CK Catering! They are always willing to make a special dinner menu just for the kids, often including chicken fingers, mac n cheese, and a veggie. It will be much appreciated by the parents and they’ll be happy to see their kids eating dinner and not filling their tummies at the sweets table the whole night. Talking to your caterer about providing kids meals for those under a certain age is not only a great idea for the kids’ sake, but it’s usually easier on the pocket as well. Having young kids at your reception doesn’t need to be a challenge. Simplifying their menu will help to easily accommodate the young-ins. More often than not, the adults actually want to eat the kids food too because it brings them back to being kids themselves! If having more than a small handful of kids at your reception, make sure you seat the kids with other kids. Both the adults and the children will have more fun this way. We tell our couples that children 7 years and older is a great starting point for a kids table. Just make sure they can be at a table without a parent – and definitely don’t seat one parent with a bunch of kids. Make sure that their parents are seated close enough to keep an eye out but still participate in adult conversation at their own table. 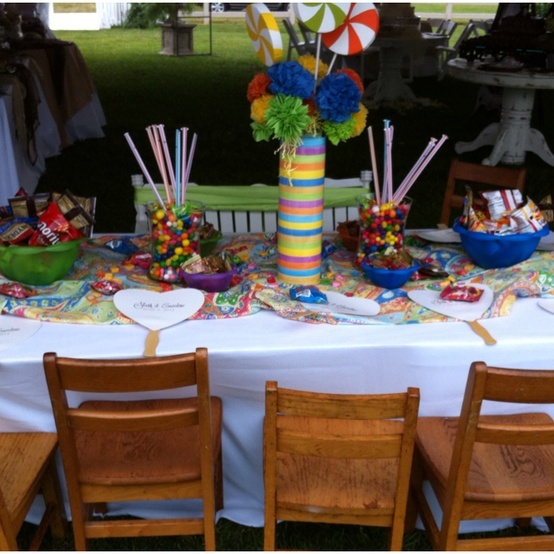 If you decide to have kids at your reception, having a kid’s table will give them a place to stay and play. There’s no shame in admitting that it also allows you to have fun with their centerpiece arrangements and the entertainment found at their table. One of our 2012 brides said this was one of her favorite parts in the entire planning process! As we all know, it doesn’t take much to keep kids entertained. 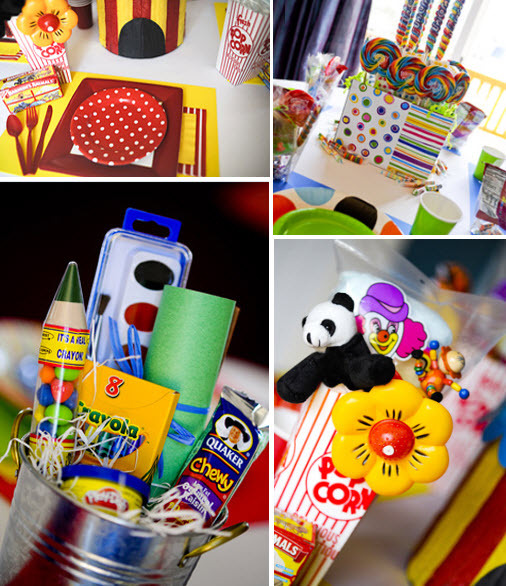 Having the kids table filled with art supplies and craft projects, crayons with coloring books, glow sticks, puzzles, you name it, will allow them to have fun with people their own age. A unique kid activity we read up on from Love and Lavendar was providing an I-Spy game for the kids to complete throughout the night. Give them a list of things to find and a disposable camera and they’ll have a blast with each other and on this friendly competition. An idea for a reception with more than a handful of kids is to do like one of our awesome Veranda couples did. They decided to rent out a separate, supervised room at The Whitcomb where they had a Wii set up, boardgames, and a kid-friendly dance party. It gave the kids their own play area as well as a safe place for them to stay rather than running around the venue. 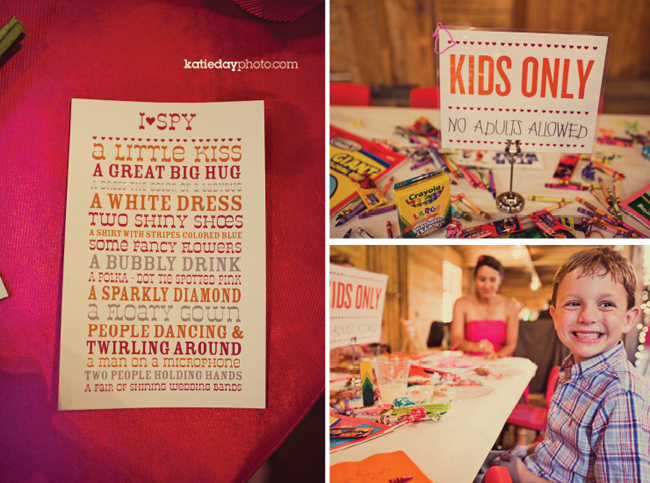 Giving kids at your reception unique, kid-friendly favors will make them feel special and will get put to better use than an adult-focused favor. Providing them with goodie bags that have their name on them will not only make them feel special but also keep the young ones entertained during the reception. Hope this post makes you wanna be a kid again – I know it does for me! If you’re in need of a few more tips and guidance with keeping the kids occupied, contact us! In the past, men have taken a back seat in being overly involved in the wedding planning process and have let the bride create their dream wedding. Well…. Step aside ladies! Men are beginning to take a much more active role in their involvement and presence in the wedding planning and big day! I love nothing more than meeting a groom who is not afraid to share his thoughts and opinions and sneak some masculine and quirky personality into what’s been pinned as a female-focused event. Because of this revelation of a groom’s eager involvement, here are some tips to infusing the perfect masculine wedding touch to help bring balance to your wedding. 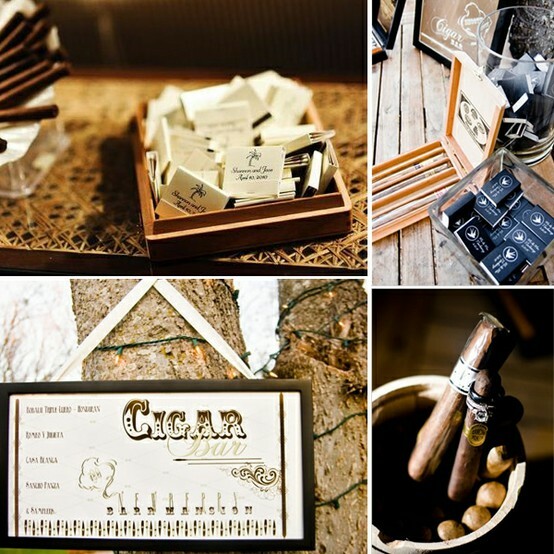 There is nothing more manly than cigars and whiskey and having those items in a lounge atmosphere for guests to relax and have some fun is a perfect way to infuse a masculine touch into the reception. Having a cigar and whiskey bar also provides guests with some side entertainment if you were to hire a cigar roller and create cigars on the spot. Even if the groom isn’t big into cigars or whiskey, he will appreciate the meaning and tradition behind it. 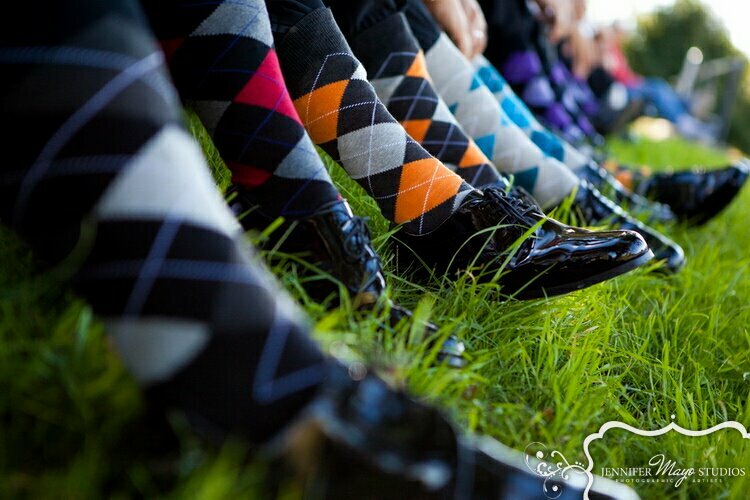 Since accessories like his boutonniere, cufflinks, and dress socks are part of a man’s fashion on the big day, it’s important for these accessories to show his personality and more often than not, his humor! It’s all about letting the man choose his own wedding day accessories! In fact, one of our 2013 weddings wore superhero action figure boutonnieres. That’s correct, you heard me right! 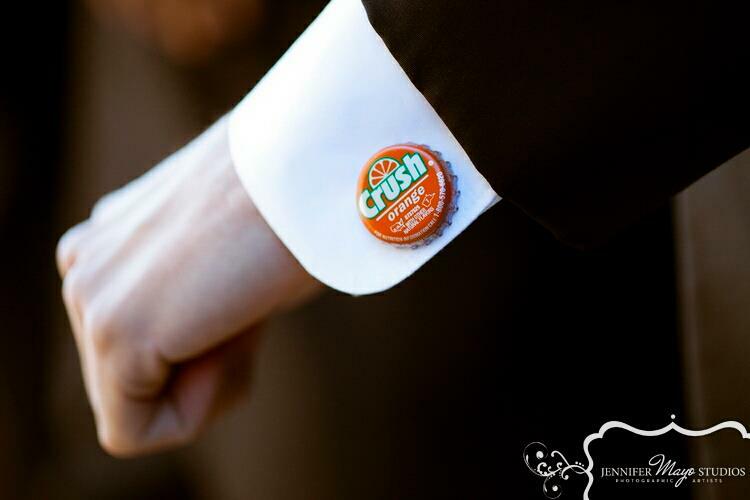 Also, in an unforgettable 2011 wedding, we had a groom choose quirky bottle-top cufflinks and socks that made a statement! Doing something as non-traditional as this allows opportunity for the groom’s input in having a unique masculine wedding touch to call his own. 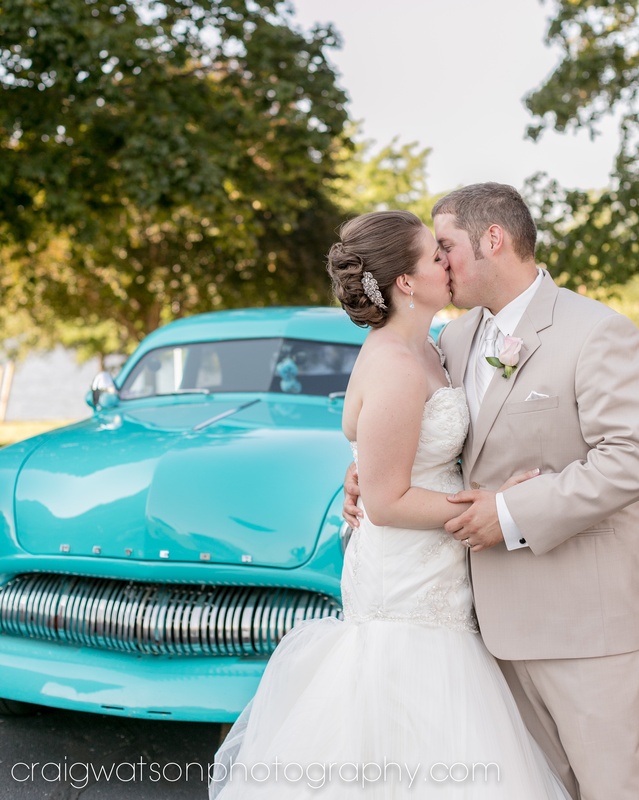 Photo Credit: Jennifer Mayo Studios. Probably one of the most noticed additions in recent years for an easy and fun masculine wedding touch has been the groom’s cake. 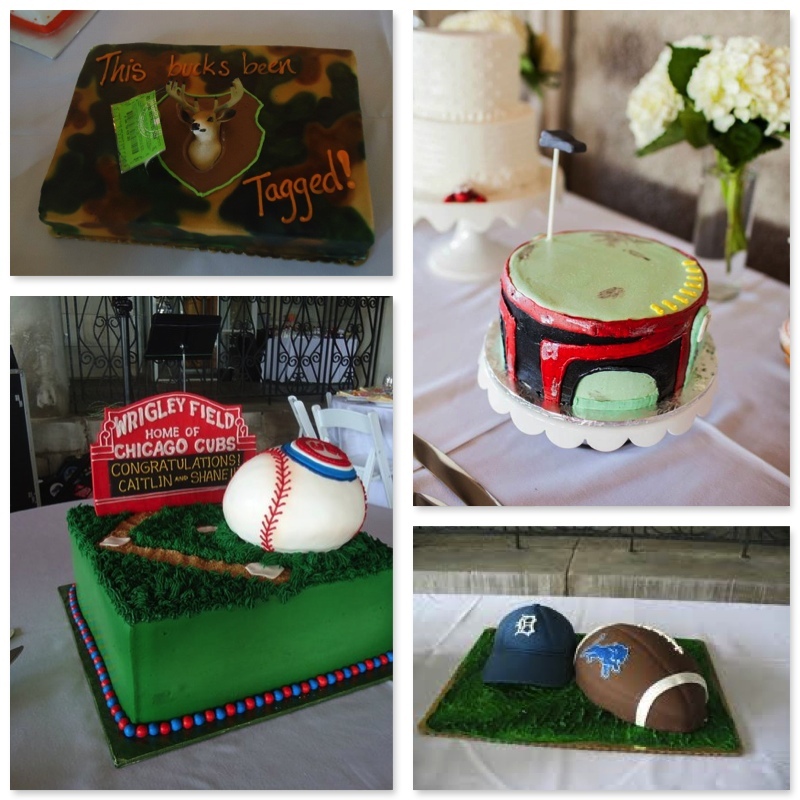 This cake should always reflect the groom and either his hobbies or personality. Boy have we seen some awesome ones! The look on the groom’s face when he realized you went the extra mile to get him a special treat is priceless! Check out the awesome (and yummy!) work of Dee’s Specialty Cakes! One of the easiest ways to balance out the feminine vs. masculine feel of the reception is to consider adding a masculine tone accent color. 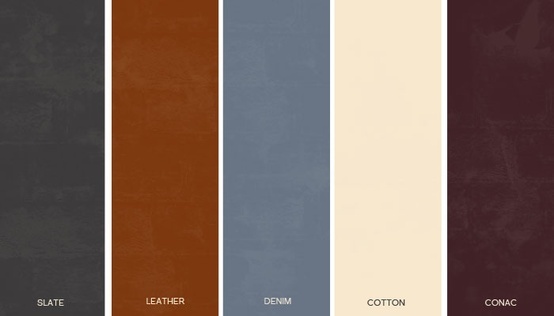 Some of the trending masculine color selections for 2013 are slate, leather, denim, cotton and cognac. Another trend when infusing a masculine wedding touch is adding in a texture with the decor. Adding textures like leather, wood, metal and earthy details adds a perfect touch of sophistication. Check out the masculine color swatch below, what do you think? Since the big day is all about the bride and groom getting married and becoming one, the reception shouldn’t reflect anything different. Infusing masculine wedding touches with feminine will create the balance you’re looking for and reflect the bride and groom perfectly. Want to hear more from 1928 Planning Co.? Contact us! I can’t stress enough to brides how important wedding lighting is. From my experiences, I feel like I’ve seen it all… those that go all-out and put a great portion of their budget on wedding reception lighting and others that stick to the natural lighting your venue offers. One of my favorite aspects about my job is that no two days are ever the same. Each day brings another much anticipated wedding, another new family celebrating a special day and new reception themes and décor. Since every couple’s personality is completely different, it’s guaranteed that their vision for their wedding will vary as well. No matter what, every couple looks to create an inviting atmosphere and appealing ambiance for their guests. Think back to when you first started your wedding planning. What were the first items on your to-do list? I’m assuming securing the venue, creating the guest list, selecting the perfect wedding vendors, deciding what décor to have and the list goes on. One of the most overlooked décor elements when planning is the wedding lighting design element. I think a lot of people view lighting at their reception as a luxury rather than a necessity. I’m here to prove that theory wrong! Whether the reception is indoor or outdoor, wedding lighting will not only enhance the look of the venue, but also enhance the décor elements you spent so much time creating and designing. Lighting can also help focus on important areas you want to make sure are emphasized, like the cake table or head table. Couples hire the best photographers to capture their special day, so they can look back and remember how amazing it all was. Guess what? Photographers LOVE shooting with lighting elements – it only makes the pictures have that much more of an impact. 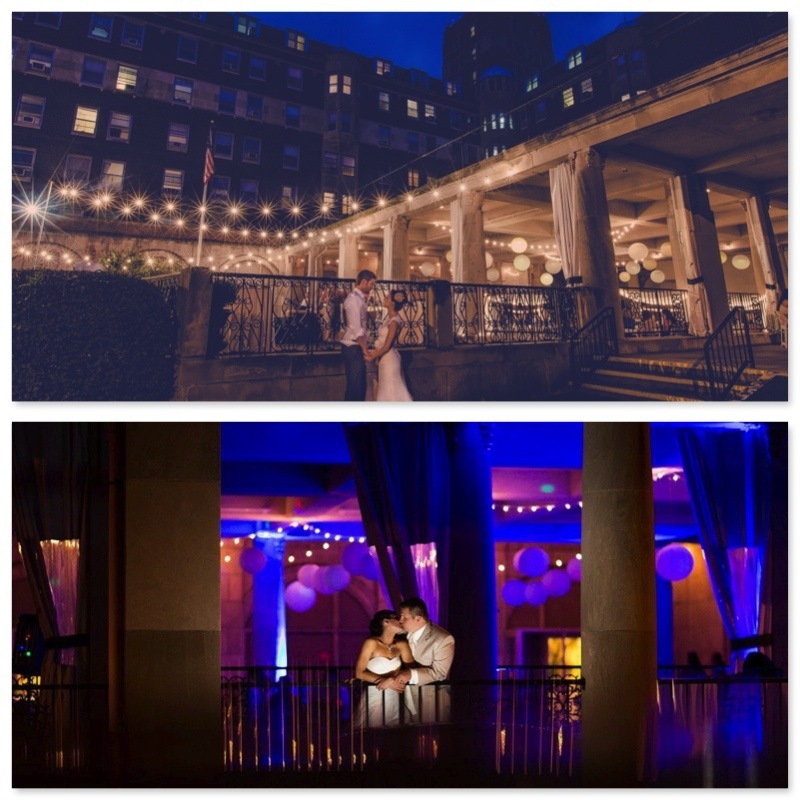 Check out some favorites where wedding reception lighting design was used to enhance one of our partnered venue: The Veranda courtesy of Jennifer Mayo Studios, 430 Studios and BJLR Photography. I bet you are wondering who was responsible for that incredible wedding lighting design… don’t worry, I have you covered! We adore the work and lighting design of Schades of Light and it’s no surprise why they top our list of local wedding vendors to work with! As part of making coordination for the big day even easier, 1928 Planning Co. handles vendor coordination for Schades of Light! 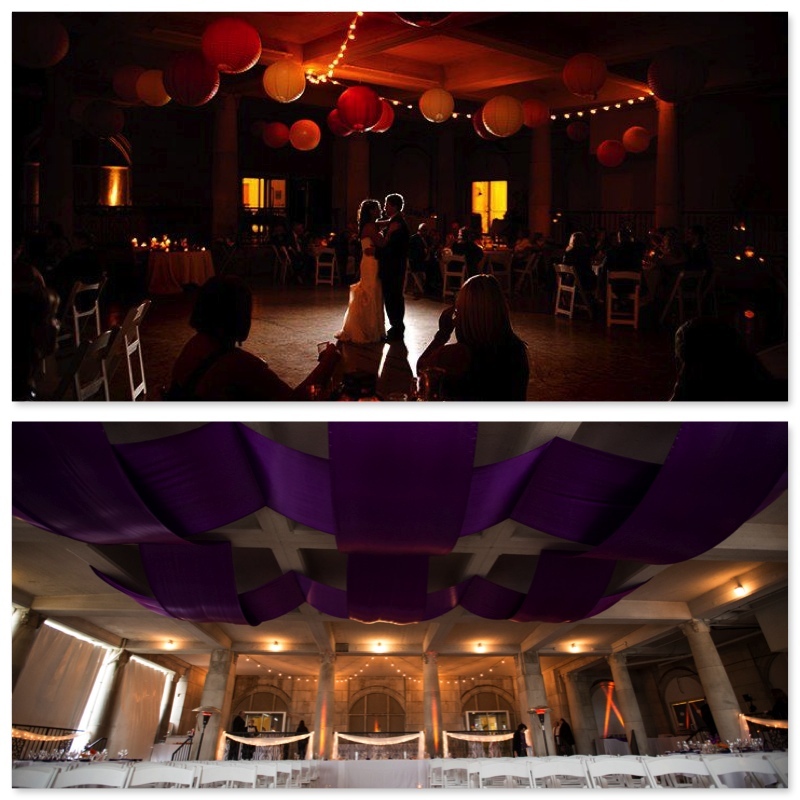 Schades of Light does a variety of decor and lighting design options, including draped fabric, paper lanterns, chandeliers, uplighting, swaged lights and fabric, etc. Their lighting designs make receptions look truly beautiful and create a warm atmosphere for guests. Contact us today to learn more about Schades of Light and how they can doll up your ceremony and reception space! Before you start planning the wedding of your dreams, most people wouldn’t have the slightest idea how much of your wedding budget vendors account for. Which brings me to a question I know all brides-to-be can relate… When meeting with potential wedding vendors and receiving pricing from them, how are you supposed to know what’s the average; the norm to spend on this stuff? No matter how big or small your wedding budget is, you don’t have to downsize on the number of professional wedding vendors you invite to be a part of the big day. It’s all about prioritizing which wedding vendors are most important to you in creating a ‘uniquely yours’ wedding reception and which takeaways you want your guests to have and remember long after the night is over. Creating wedding budgets are said to be some of the most stressful, frustrating and hair-pulling moments in the planning process. The 1928 team is always looking to alleviate stress or concerns the couple may have during the planning process. As part of our Coordination Services, we’ll create a personalized budget for you that itemizes spending categories, forecasted vs. actual spending amounts as well as reminders on when payment installments and final balances are due with each vendor. As an experienced planner, I think this coordination service in particular is well worth the investment, to simply not have to worry about keeping a tedious organized wedding budget all on your own. My tips for doing a budget breakdown yourself – take it stride by stride. Don’t let the costs get away from you! Plan ahead on what you’re looking to spend and know what your wedding budget will allow. These percentages are a great starting point and sticking with them will ensure a top-notch wedding with quality vendors without breaking the bank. Contact us with questions and as always, happy planning! We are all about DIY wedding planning and expressing your creative side. We’ve been seeing a consistent ongoing theme of using mason jars at weddings. 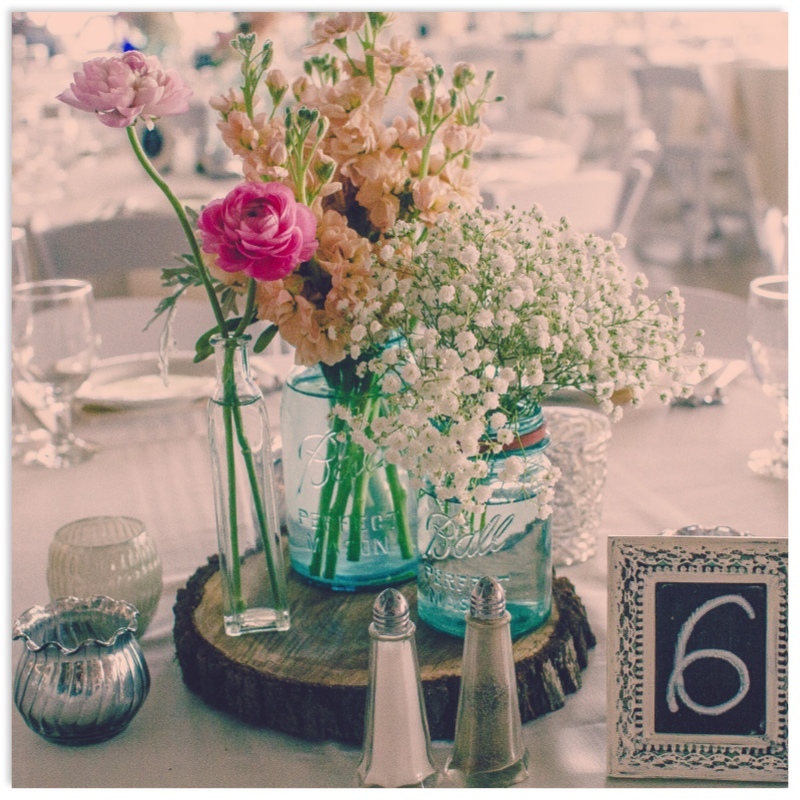 We love it when couples think out of the box and use them in multiple ways: not only used as drinking glasses for guests but for pillar candle vases, table number holders, and DIY mason jar centerpieces! Do it yourself (DIY) wedding ideas are a great way to not only save some money in your wedding budget but to personalize your wedding decor. We love the simplicity of wedding centerpiece ideas like this – it doesn’t take much to make a statement when you’re using a stained mason jar. Going to a local farmers market to pick up fresh flowers and creating your own flower arrangement rather than using a florist is a great alternative. Overall, this DIY wedding centerpiece project is DIY-friendly, cost effective, and totally different from going the traditional wedding centerpiece route. If you’re feeling a bit more crafty, you could add a touch more to the jar to dress it up a bit. We’ve seeing people accent the mason jars with burlap fabric, lace accents, and tying twine around the jar displaying the wedding date, monogram, or a quote. Keeping with a simple flower arrangement will look best for this kind of centerpiece because the mason jar is what’s making the statement. Being completely interchangeable, use twine, ribbon, lace, etc. to be an accent of your wedding colors. You’ll be surprised at how much fun and stress-relieving DIY wedding centerpiece ideas can be, all while saving a few bucks! Grab some family members or bridesmaids and make a day of it! Stay tuned to learn more DIY tips and projects to create the perfect setting for your wedding day! Contact us in the meantime for helpful DIY tips!